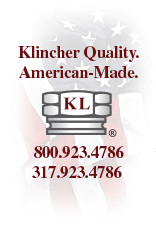 Precision CNC Machined Parts, Screw Machine Parts, and the Manufacturer of Klincher™ Locknuts and Klincher Kapscrews™. Dual Machine Corporation has been producing screw machine parts since 1945 and precision CNC machined parts since the early 2000’s. Watch our Company Overview Video! The world-renowned Klincher Locknut was patented in 1943 and has been one of the primary products we manufacture since we acquired that business in 1998. Various versions of the Klincher Locknut are key components used in the manufacturing of jet engines for aircraft, turbines, turbochargers and other applications involving high temperature, high vibration and high stress. Nearly every major jet engine and aviation manufacturing company, including Pratt-Whitney, Rolls Royce, GE, Boeing, etc. 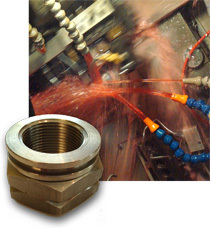 use a version of the Klincher Locknut, as well as other products we manufacture, every day. The US Military also uses Klincher Locknuts. Our Klincher Kapscrews also have been used in a diverse range of high vibration applications when a heavy-duty self-locking cap screw is needed. Dual Machine Corporation also provides a wide range of CNC and screw machine parts for a diverse list of industries and applications that demand precision and reliability. Dual Machine Corp. is an ISO 9001:2015 and AS9100:2016 Certified company making critical components for some of the most demanding applications in the world. From the complex to the most basic parts, Dual Machine can meet your machining needs, as well as your deadlines and budgets. Call Dual Machine today, to see how we can help you solve your manufacturing, lock nut and machined parts needs. Watch this informative video about Dual Machine Corporation’s capabilities and services. This short video takes you on a tour through our plant in Indianapolis, Indiana. Dual Machine Corporation is now AS9100 Certified. This certification is the primary standardized quality management system for the aerospace industry. © Copyright 2019 Dual Machine Corporation. All rights reserved.